You want that concrete gone! Here is how you decide the best tool to break up concrete. You’ve stepped on that broken, dated, and unappealing concrete patio or steps for the last time and you’re ready for something new. You could call a contractor to get rid of it for you. But even for small jobs, professional help can quickly eat up the money that should be going to laying new, beautiful concrete. Breaking up concrete is a job you can do yourself. And it doesn’t have to kill your back. All you have to do to make the job of breaking apart concrete simple and painless is choose the right tool. Before you even think about the most appropriate tools for destruction, you need to protect yourself. Have a pair of heavy duty gloves to protect yourself from blisters and safety goggles for the inevitable chunk of flying debris. When thinking about breaking up concrete, most of our minds jump straight to jackhammer. But you can probably do the work with a metal sledgehammer and a little elbow grease. Sledgehammer is the best tool to use if the slab of concrete is three inches thick or less. Dig at the base of the slab to find the bottom. If the distance from the bottom to the top is at or under three inches, hammer away! Recruit a buddy to lift a corner with a pry bar. Start slamming at the corners and work your way towards the center. Pry and pull out the broken chunks as they break apart. Don’t hit the same spot twice. Keep moving and keep lifting with that pry bar. You have a slab that is thicker than three inches. That means you want to buy or rent or borrow an electric or pneumatic jackhammer. Electric and pneumatic jackhammers both break up the concrete using a high-power and fast moving pointed chisel into the concrete, so deciding on one is simply a matter of availability, price, and preference. Just make sure you are strong and agile enough to control and move with the jackhammer. Break it apart and then shovel the chunks of concrete out after you’re done. 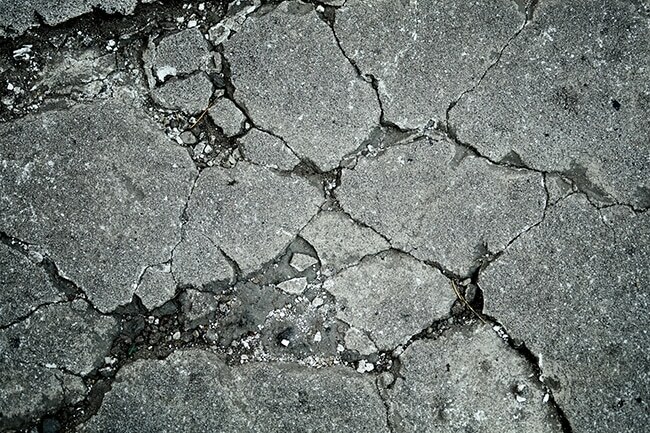 You may need to remove concrete that is not simply a flat slab. Or, you may want to have more control than is possible with a sledge hammer or jackhammer. In that case, you want to rent or buy a chipping hammer. Chipping hammers are built light and handheld so they offer the most control for tight spaces, strange corners, and spots near windows. You’ve chosen the best tool. You’ve used that tool to break apart your unwanted concrete. Now, what do you do with all those chunks? Knowing how to dispose of all that concrete is a big part of the job; a 12 x 14-ft. patio can weigh up to about 5,000 pounds. First task: call your local waste facility and ask about their policies on throwing away concrete. Some facilities will have separate, cheaper drop-offs for building materials like concrete. You may need to rent a truck or a trailer to transport and dump what is left of your demolition efforts.